In case you’re wondering, the answer is no. You don’t need to be an expert facilitator or a miracle worker to bring out the strengths and tighten the bonds of your work group. But you do need to try new things – and that’s what this quick group activity is all about. It works great with any team numbering up to about 15 people. It uncovers everyone’s strengths in a constructive and co-creative way. Best of all, the benefits are powerful and long-lasting. In terms of materials, all you need are small envelopes, index cards, and a pen or marker for each person. • Now for the heart of the activity: Take one of the envelopes, noticing the name that’s written on it. Think positively about this co-worker. Reflect on some of your positive interactions with them – and some of the positive things you’ve seen in their interactions with others. Look for words that capture their positive qualities. Then take the index card, write down what you view as their greatest one or two strengths, put the index card back in the envelope, and seal it. • Take a second envelope from your stack, with the name of another person written on it, and repeat the activity. Do this for all the envelopes/people, so that you’re thinking positive and documenting the strengths of everyone in the group. • Take enough time for this, and avoid talking. The room should stay quiet while everyone reflects and writes. • The work group manager or team leader should participate as an equal, following all the steps in this activity in the same way as everyone else. • Recommended: Write more than two or three words on a card. Try to expand out, perhaps even writing the strength(s) in the form of a note to the person. Aim to be conversational. One way is to cite a strength and then write an example of when you saw that strength in action. (Example: “Your empathy always shines through. When that complaining customer came in last week, you really listened, you showed understanding and concern, and you totally put them at ease. What a tremendous strength!”) Whatever you write, be sure to focus on strengths, and keep it entirely positive. • People can sign their messages if they want, so that the reader knows who wrote what. This is optional, but recommended. Even without a first-name signature, anonymity is hardly guaranteed, because people can recognize handwriting. • As you go from envelope to envelope in your stack, remember to seal each one with the card inside. • When you get to the envelope with your own name on it, turn the positive light on yourself. Write down one or two of your own great strengths. Then seal the card in the envelope like you’ve done with all the others. • After everyone is done writing, have them pass around all the sealed envelopes so that each person gets all the envelopes with his or her name on them. Each person should end up with one envelope from every other person in the group (along with the envelope containing the card they wrote about themselves). • Now for the big takeaway! As the session concludes, everyone takes their stack of envelopes with them. During the coming days and weeks unfold, they can open them whenever they want. Some people will open one envelope a day, some will opt for one a week, and some will be more random. You might even have someone who opens them all at once. It doesn’t really matter. The bottom line is, whenever a person needs to get a recharge by hearing about one of their strengths, they can open an envelope and read all about it. 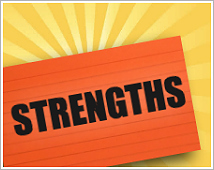 Bonus: They can keep the cards with those positive words, as a constant reminder of their great strengths. • When the cards are signed, there’s often a circling back in which the recipient thanks the co-worker for their kind words. This is the kind of positive engagement we need more of in most workplaces! 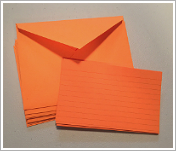 • To brighten up this activity: Use brightly colored envelopes with matching index cards. An attention-getting color will signal that this is a different kind of exercise, and it will ensure that the envelopes and index cards stand out from the usual workplace paper. This whole experience will cost about $15 for the envelopes and cards. The return on investment? Incalculable. Next Level Workplace, and Next Level Keynotes are trademarks of Tom Terez Workplace Solutions Inc.